The Epson Expression Home XP-325 is a popular printer for many reasons. It belongs to a small range of all-in-one inkjets for use in the home. It is a printer, scanner and copier in one, and the range in general promotes cost-effective printing. It also has a Wi-Fi connection for easy wireless printing from a range of devices in the home. This makes the ink in your XP-325 go that little bit further. The printing quality is not sacrificed whatsoever, due to the crisp and clear quality and vibrant colour. This makes for perfect photograph printing from home, as the XP-325 produces perfect glossy photo finishes. There is a misconception at times that wireless printers requires lengthy set-up processes, however this printer needs minimal effort. The automatic set-up means that the printer and the device you are printing from, whether it be desktop, laptop, tablet or smart-phone! Another feature of the XP-325 is the 3.7cm LCD screen display which allows clear and easy navigation. How to get rid of the faded prints in an Epson XP-325 Printer? The Epson XP-325 printer is an all-in-one printer and is apt for home and small offices. It uses Epson XP-325 ink cartridges. It gives a good print quality, but at times, there might occur printing problems like faded prints or missing prints. You might think that the cause for this is low ink in the ink cartridges. If that is the case then the printer will reflect a message on the LCD screen. Replace the old cartridges with the new Epson XP-325 ink cartridges. Along with cartridge replacement, clogged print head nozzles also need to be cleaned. You need to know that this process uses extra ink but it clears off the nozzles from clogged and hardened ink. Hence this process becomes necessary to retain the good print quality that the printer gives. Turn on the printer. If the ink light is on then you first need to replace the ink cartridge. On your PC, open the printer software and go tot the Utility tab. Click on the Head Cleaning button and follow the further instruction as given by the software. The ink and power lights will blink continuously throughout the process. Make sure you do not turn off the printer or else it will damage the machine. When the power light stops flashing, click on the Head Cleaning option in the software followed by Print Check Pattern. Give the confirmation that the print head has been cleaned and take a test print. If the test print is not clear or broken then repeat the above cycle again and then take a test print. If the problem persists then you need to run the head cleaning cycles four to five times, take a nozzle check pattern test print. Make sure that you use the original Epson XP-325 ink cartridges only for the machine. Q. 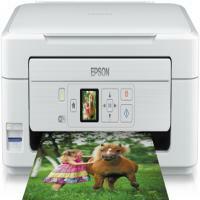 Does the EPSON XP-325 printer support any mobile and Cloud printing services? A. Yes, EPSON XP-325 supports mobile and Cloud printing services like Epson Connect (iPrint, Email Print, Remote Print Driver), Apple AirPrint and Google Cloud Print. Q. Does the EPSON XP-325 printer have an LCD display? A. Yes, it has a 3.7 cm LCD display. Q. Does the EPSON XP-325 printer support borderless printing? A. Yes, this printer supports borderless printing. Q. What should I do if I miss the delivery of my EPSON XP-325 ink cartridges? Will I have to order again? A. All our orders are delivered by Fastway Couriers. Fastway Couriers will attempt to make two deliveries to your door. If nobody is there to receive the order, the items will be returned to their central depot or to our warehouse. After the second delivery attempt, any further attempt will incur an additional charge of €4.95 inc VAT. Please contact us by telephone on 048 30833221 or email us at info@printerinkcartridges.ie to check your order status. Q5) Do you offer any guarantee on EPSON XP-325 ink cartridges? Yes, our compatible EPSON XP-325 ink cartridges are FSC tested and certified and come with a warranty period. If the product is deemed to be faulty we will replace or refund the item from 12 months following the date of purchase. Q. Do you guarantee a security of my credentials while conducting a transaction for EPSON XP-325 ink cartridges? A. When you purchase items on this website, the payment will be hosted by Sage Payments to ensure maximum security of your credit/debit card details. The information provided by you will remain protected and no third party will have access to it. Q. Can the EPSON XP-325 printer directly print pages from a memory card without using a PC? A. Yes, you can directly print pages from a memory card on this printer. You need to navigate on the LCD to use this functionality. Q. How to check if printhead needs cleaning? A. If the nozzles are clogged, and the printouts become faint, there is visible banding, or unexpected colours might appear. When a print quality gets declined, use the nozzle check feature and check if the nozzles are clogged. If the nozzles are clogged, clean the print head. Q. Why it is important to replace the EPSON XP-325 ink cartridges after a period of time, even if there is some ink left in the cartridges? A. Yes, it is recommended to do so as if the cartridges are left in the printer even after the given period of time after their expiry, it may affect the printer performance and you might get low quality or poor print results using them. Q. What instructions must be followed while handling the cartridges? Do not place or store the printer outdoors, near excessive dirt or dust, water, heat sources, or in locations that are subject to shocks, vibrations, high temperature or humidity. Q. What are the various operating systems supported by EPSON XP-325? A. The operating system supported by EPSON XP-325 is MS Windows XP, MS Windows 7, Apple Mac OS X 10.6.x, Apple Mac OS X 10.4.11, Apple Mac OS X 10.5.8, MS Windows Vista, MS Windows XP 64-bit Edition. Q. Where can I contact you if my order for the EPSON XP-325 ink cartridges is not received on time? A. For any sort of query with your products please call us on 048 3083 3221. Q. How should I perform the nozzle check utility to check the clogged nozzles? A. Colour casting can be caused by blocked nozzles on the printhead, you may be able to identify the problem by checking the printhead nozzles. If the colours are missing you can check the print head nozzles from your computer by using the nozzle check utility. Performing a nozzle check will determine if any of the nozzles are blocked. Q. How do I monitor the ink levels on my EPSON XP-325 printer using Windows 2000 or XP? A. To monitor the ink levels of the printer, you first need to install the EPSON Status monitor utility supplied on the CD-ROM Epson printer software. To access the Status monitor you can proceed by clicking on start, select settings and then Printers. Right-click on the icon for the relevant printer and select your printing preferences. Click on the utility tab and click on the icon for the status monitor. This will now display your all the ink levels. Q. What to do if the EPSON XP-325 ink cartridges drained out? A. When the cartridges drained out or get empty, you need to replace them immediately with the new ones. Avoid refilling of the cartridges, instead, you can purchase compatible ink cartridges from our site. Q. What type of paper size does the EPSON XP-325 printer use? A. It is always recommended to use the good quality paper for the printing purposes. The printer takes A4 size as the standard paper size for printing any document. Q. Can I store EPSON XP-325 ink cartridges for a long time as I was planning to buy them in bulk at suitable prices? A. Yes, you can buy several packs of the cartridges. But the only risk to store the cartridges for a long time is that the ink inside them will start drying up with time as the minimum life of the cartridges is about 6 months. If the EPSON XP-325 ink cartridges are stored correctly in cool and dry place and are used before expiry date printed on them, the ink cartridges will work fine with your printer. Q. Does the ink last long in the cartridges for this printer? A. The ink will last according to the amount of printing that will be done. Generally, an ink volume of 11ml will print around 450 pages. Q. Can you tell me the exact volume of ink in the compatible EPSON XP-325 ink cartridges? A. The compatible EPSON XP-325 ink cartridges offer more ink volume than the original cartridges. It has 16mL ink in black cartridge and 11mL ink in cyan, magenta and yellow cartridge. Q. I am planning to buy compatible EPSON XP-325 cartridges in place of original ones since compatible ones have more ink quantity. Will the quality of prints deteriorate? A. Not at all, be carefree about the print quality. We assure you that the print quality is same as per with the original cartridges. The compatible EPSON XP-325 ink cartridges are equally efficient as the original ones. Using compatible cartridges is always a wise option since it saves on money offering more number of copies. Q. Is there any way in which I can alter the number of cartridges of each colour in a multipack? I wanted to order the multipack of 20 EPSON XP-325 ink cartridges where I wanted more number of black ink cartridges than the cyan ones. Do I have to order black cartridges separately? A. Many customers have the same dilemma and want to alter the number of cartridges according to their needs. Our multipack system is very flexible and we allow our customers to alter the number of cartridges of each colour where all the cartridges should sum up to the number of cartridges mentioned in the multipack. For your case, you can alter all the colours where the number of cartridges should sum up to 20. You can use the following link to order and alter according to your demand: https://printerinkcartridges.ie/epson-18xl-multipack-ink-cartridges. It is always advisable to buy multipacks instead of individual cartridges as it saves on money. Q. Does EPSON XP-325 enable the user to print directly without using PC connection? A. Yes, the printer allows you to connect various devices without connection of PC. The XP-325 enable you to easily print wirelessly from smartphones and tablets. The automatic Wi-Fi connectivity makes configuring laptops and computers to print wirelessly extremely easy. It also lets the user print directly from a memory card and browse settings through LCD display. Q. Can you guide me as to how should I install Wi-Fi settings for EPSON XP-325 printer? A. For connecting Wi-Fi you need not know your network settings as the XP-325 automatically finds the relevant connection settings in order to configure itself. Q. I own a cyber café in Galway and I wanted to order multipack of 12 EPSON XP-325 ink cartridges. The delivery is required to be delivered within this week since my stock of cartridges is about to be exhausted. Where can I appeal for a fast delivery? A. All our deliveries are made within 24 hours of the order being placed. 90% of the orders made before 2 pm are dispatched the same day. Only when there is a lot of traffic or rush of work on our courier partners, that’s when the delivery might take 1-3 days. Be carefree as the delivery of your cartridge won’t take more than 3 days. Q. My EPSON XP-325 broke and I have some EPSON XP-325 ink cartridges in stock.Can I use them with some other printer? A. Yes, our cartridges are compatible with more than one printer. The cartridges you have are is compatible with: Epson XP-30, Epson XP-202, Epson XP-205, Epson XP-302, Epson XP-305, Epson XP-402, Epson XP-405, Epson XP-405WH, Epson XP-212, Epson XP-215, Epson XP-312, Epson XP-315, Epson XP-412, Epson XP-415, Epson XP-225, Epson XP-322, Epson XP-325, Epson XP-422 and Epson XP-425 .The cartridges are equally efficient with this printer as they were with your EPSON XP-325.